On occasion, we share news of major developments taking place in the Cleveland or Columbus areas that provide such opportunities for Richland Countians. One such project was announced this past week which may well put a holiday smile on the faces of soccer fans in Mansfield, Shelby, Ontario, Lexington, and elsewhere. City and county officials along with the Columbus Partnership have announced next steps in the purchase of Columbus Crew SC and details of a plan for MAPFRE Stadium. 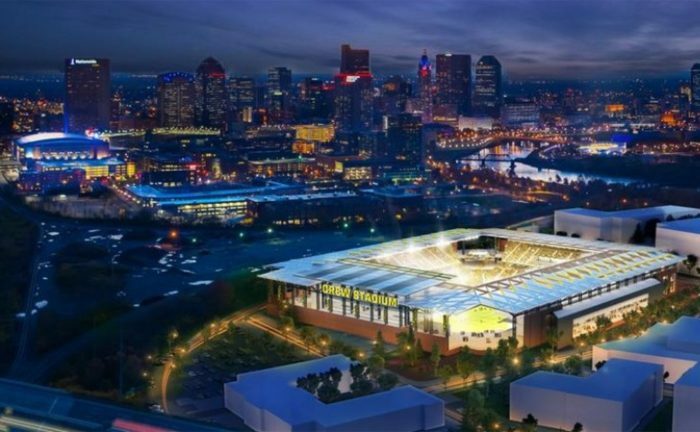 Working under the deadline imposed by Major League Soccer to keep the Crew in Columbus, the families of Cleveland Browns owners Dee and Jimmy Haslam, and Dr. Peter Edwards of Columbus have been working to complete the purchase by the end of the year. The City, county and new ownership are working toward a Memorandum of Understand (MOU) to solidify the details of the sale of the team, a new soccer stadium and the repurposing of MAPFRE Stadium. The City has committed funds for infrastructure and land for a new stadium, while the County will be contributing money as well. Mayor Andrew J. Ginther announced that part of the proposal includes moving the Crew’s practice facility to MAPFRE Stadium once the new stadium is complete. The stadium will be turned into the Columbus Community Sports Park, a shared-use center with an indoor soccer field and basketball courts, tournament-level outdoor athletic fields and programming spaces for multigenerational activities. Renderings of the new stadium can be seen below.